Barcelona completed their Champions League Group D campaign with a 2-0 win over Sporting Lisbon at the Nou Camp. With the LaLiga leaders already qualified as group winners and a testing trip to Villarreal ahead on Sunday, coach Ernesto Valverde made the expected wholesale changes as talisman Lionel Messi started on the bench. After a lacklustre first half, Barcelona broke the deadlock after 59 minutes when Paco Alcacer headed in from a corner and former Barcelona defender Jeremy Mathieu netted an own goal in stoppage time, which left Sporting having to be content with a Europa League spot after finishing behind Juventus. 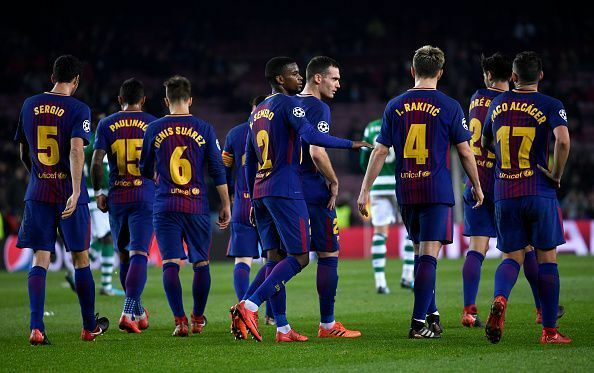 Perhaps not unexpectedly, the match lacked any real tempo during the opening exchanges, although Barcelona aimed to make the most of some wayward early defending from the visitors. Sporting, who needed Juventus to slip up against already-eliminated Olympiacos to stand a chance of progress, created a couple of chances themselves before Andre Gomes robbed William Carvalho and flashed a 20-yard shot wide. On 24 minutes, Sporting needed a smart save from Rui Patricio to beat away an angled drive from Luis Suarez after the Uruguayan was played into the right side of the Sporting penalty area. In the 35th minute, Nelson Semedo fouled Bruno Cesar after a Sporting counter attack, which earned the Portuguese full-back a caution which means he will be banned for the first leg of Barcelona's last-16 tie. Barcelona started the second half with more purpose, as Aleix Vidal saw his shot deflected over. Luis Suarez sent a tame, 20-yard free-kick straight into the wall before Barcelona finally made the breakthrough just before the hour mark. Denis Suarez lofted a corner in from the left, which Alcacer got up to meet at the near post and glance a header back over the keeper. Messi was sent on to replace Vidal, but Sporting should have been level just a couple of minutes later. The ball was whipped in from the right through the Barcelona penalty area, where substitute Bas Dost arrived unmarked and fired his snapshot at Jasper Cillessen from point-blank range only to see his fellow Dutchman somehow produce a remarkable reaction save. Messi forced Patricio into a diving save when he looked to slot a low effort into the bottom left corner after some more neat Barcelona passing at the edge of the Sporting penalty area. Dost scuffed his angled shot into the ground and over the crossbar when a looping cross from Marcos Acuna dropped to him after ghosting into the right side of the Barcelona box. Messi fed Alcacer into the right side of the penalty area, but his low shot was deflected just wide of the far post by a last-ditch tackle from Cristiano Piccini. Barcelona added a second in stoppage time when Mathieu, who left the Nou Camp in the summer, slid in to try to intercept a left-wing cross from Denis Suarez, but could only divert it into the net, with Alcacer ready for what would have been a tap-in.